Mark Twain, ca. 1907. Image courtesy Wikimedia Commons. In his column of Jan. 7-8, Sam Sacks wrote of "Twain's now out-of-copyright masterpiece, 'The Adventures of Huckleberry Finn.' " Decades ago, the scholar Philip Young pointed out the error, writing that "Adventures of Huckleberry Finn has no definite article in its title, though one is usually put there...Huck ends his book with anticipations (never fulfilled) of further goings-on in the West. For this reason, very likely, Twain hesitated to call the job he had done definitive." Ironically, Sacks makes this error in noting a new book by Robert Coover that purports to be a sequel to Huck Finn. The ending of Huck Finn is famously - or notoriously - open. In closing, Huck tells of his plan "to light out for the Territory ahead of the rest, because Aunt Sally she's going to adopt me and sivilize me and I can't stand it. I been there before." Few great novels end with a preview of coming attractions (Twain began a sequel, but never finished it), yet it is unlikely that this lack of resolution bothered Twain, because for him the essence of art lay in the voyage rather than the destination: as Huck said in his first chapter, "All I wanted was to go somewheres; all I wanted was a change, I warn't particular." When Huck Finn's open ending became a target for criticism, no less a commentator than T. S. Eliot defended it, contending that Huck, like the Mississippi River, could have no discrete beginning or end: "Huck Finn must come from nowhere and be bound for nowhere." Mark Twain did not write his novels with a conclusion in mind, but discovered his plots as he wrote. He once remarked that "I have noticed...that as the short tale grows into the long tale, the original intention (or motif) is apt to get abolished and find itself superseded by quite a different one," and his good friend William Dean Howells observed that "So far as I know, Mr. Clemens is the first writer to use in extended writing the fashion we all use in thinking, and to set down the thing that comes into his mind without fear or favor of the thing that went before or the thing that may be about follow." 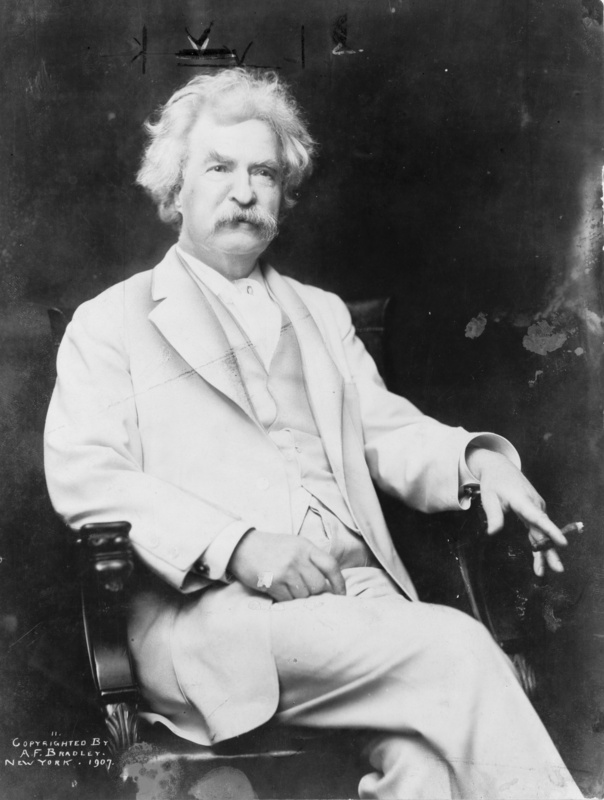 Twain often put his novels aside when he could not see how to continue their narratives: Huck Finn was written over an elapsed period of eight years, in at least four discrete phases, as Twain encountered unanticipated problems, and responded to each after taking time to think about a solution. He always found endings problematic, and the ending of Huck Finn has been considered a glaring weakness ever since the book was published. Twain's struggles with endings were in fact not idiosyncratic, but are typical of experimental writers. So for example on Sept. 5, 1926, Virginia Woolf recorded in her diary that she was "within sight of the end" of To the Lighthouse, but she confessed that she was "casting about for an end...I am feathering about with various ideas." Yet after agonizing over the problems to be resolved, she conceded that "I shall solve it somehow, I suppose." And so she did, as eleven days later she wrote the novel's final paragraph. Nor is difficulty with endings unique to writers: it appears equally among experimentalists in many other disciplines. Celebrated examples include Paul Cézanne revising a single canvas for months, or years; Alberto Giacometti beginning a sculpture anew each morning, and tearing it apart at the end of each day; and Frank Gehry revising his designs even after a building appears to have been completed. These and many other great experimental artists have only a vague sense of what they are trying to achieve, so they are reluctant to call a halt to their search for their ever elusive goals. In his column, Sam Sacks notes that Mark Twain resented anyone who tried to profit from his works, and so it is now amusing to imagine the insults he'd aim at Robert Coover for his sequel to Huck Finn. But Twain's pride in his achievements was great, and he equally resented anyone who misrepresented them. So it is perhaps not fanciful to imagine that Twain might also have had at least a few choice words of abuse for Sam Sacks' error in referring to his masterpiece.